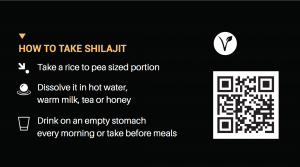 How To Take Natural Shilajit? The recommended amount of Shilajit for general use and to maintain optimal health is around 300-500Mg. – pea sized portion per day. There is approximately a 6-8 week period for the effects to be noticed. Start off with 300Mg. per day and add 100Mg. per day until you achieve the desired results. Always dissolve your blackresin shilajit in the cleanest, purified water available. The combination of humic acids with inorganic chlorine and fluoride salts are topics that are not without controversy, blackresin is not one to shy away from such controversy and consider the well-being of our customers and others a-like a priority We supply pure shilajit resin that’s been filtered using Himalayan mountain spring water, so we recommend that our customers also remain true to the products integrity and that the Shilajit is also mixed and consumed with pristine and pure spring water. blackresin’s shilajit outperforms all traditional shilajit resin suppliers in purity and efficacy, please click here to see our purification and filtration process CWC Lab Report.